Sterling and Brexit was the center of focus during the early part of last week. The parliament vote on Brexit was postponed to at least January. UK Prime Minister Theresa May survived leadership challenge but her position is shaky with more than one-third of her MPS voted against her. The visit to EU was seen as a complete failure by some as May only got some vague clarifications and assurance from EU. It’s still unknown how May could get the Brexit agreement through the Commons. Sterling ended as the weakest one last week after all. On the other hand, Dollar ended as the strongest one, with the help from worries over global slowdown. In particular, China and Eurozone released some very poor data. But the US is not without it’s own problem. The sharp selloff in US stocks on Friday argues there are worries that global slowdown would eventually spread to the US. Yield curve has ended the week inversion between 2- and 5-years. Focus will turn to Fed’s rate hike this week, and more importantly, new economic projections. Looking pass all the “specific” risks of Brexit, trade war, Italy budget and emerging markets, global slowdown is the main theme in the financial markets right now. In particular, China’s engine has slowed notably. November’s sharp deceleration in import growth from 21.4% yoy to 3.0% yoy and exports growth from 15.5% yoy to 5.4% yoy, in USD term, was the first alarm. Then industrial production growth slowed from 5.9% yoy to 5.4% yoy and retail sales slowed from 8.6% yoy to 8.1% yoy. The shift from export to domestic demand seemed not working well. Turning to Eurozone, outlook is even worse. Eurozone December PMI composite dropped to 49-month low at 51.3, with PMI manufacturing at 35-month low of 51.4, PMI services at 49-month low at 51.4. German PMI composite dropped to 48-month low at 52.2. France PMI composite dropped 49.3, 30-month low and first contraction in 2 1/2 years. ECB President Mario Draghi said the policy maker’s discussion were with “continuing confidence with increasing caution”. But such description might need to change as growth momentum slows further in 2019. The main positive development currently, is that US-China trade negotiations seemed to be making real progress. In particular, China as already started large purchase of US soybeans. Also, retaliation tariffs on US autos and parts were suspended for 90 days through March 31. It seems that both sides do want to make a deal and more information regarding China’s reforms could be released in the upcoming weeks. Trump claimed that China’s economy was growing much slower than anticipated because of “our trade war with them”. We won’t object to that. It’s just a matter of when the slowdown in China, and other parts of the world, would feed back, through the interconnected global economy, to the US. The US PMI composite dropped to 19-month low at 53.9 in December, which indicated that momentum is fading. And judging from the development in the stock and treasury markets, the US economy is far from being safe. Over the week, DOW closed down -1.18%, S&P 500 lost -1.26% and NASDAQ dropped -0.84%. At the time same time DAX rose 0.72%, CAC rose 0.84% and FTSE rose 0.84% too. Asian markets were mixed only. Nikkei continued to suffer most and lost -1.40%. Singapore Strait Times lose -1.09%. But China Shanghai SSE was merely down -0.47%. Hong Kong HSI even closed up 0.12%. DOW’s near term outlook is rather bearish with another close below 55 week EMA. As long as last week’s high at 24828.29 holds, further decline is in favor to extend the medium term correction from 26951.81. We’d maintain that, even though interim fluctuation could be seen, such correction should extend to 38.2% retracement of 15450.56 to 26951.81 at 22558.33 before completion. US treasury yields somewhat stabilized last week but lacked momentum for meaningful recovery. It should be noted that 3-year yield closed at 2.732 la while 5-year yield closed at 2.736. That is, this part of the yield curve is not inverted any more. However, 2-year yield closed at 2.741. That means, yield curve is now inverted between 2- and 5-year yields. Eyes will turn to FOMC rate decision this week. Fed is still generally expected to raise federal funds rates to 2.25-2.50%. There shouldn’t be any surprise. And the question is on how many more rate hikes Fed will deliver next year. And, given that Fed Chair Powell has confused the markets with his “rates just below neutral” rhetorics, he’s obliged to give more clarifications. And of course, what matters most is Fed’s new economic projections, including growth, inflation, federal funds rates and long-run rates. The FOMC decisions are, after all, rather scientific. But as of now, Fed fund futures are only pricing in around 46% chance of federal funds rate being at 2.50-2.75% and above after June FOMC meeting. That is, there is less than 50% chance of one rate hike in H1. Investors are rather unconvinced Fed’s projections should provided enough guidance for markets expectations. And they would also set the tone of the markets at least through January. Dollar was the strongest major currency last week. But the outlook isn’t too convincing yet. 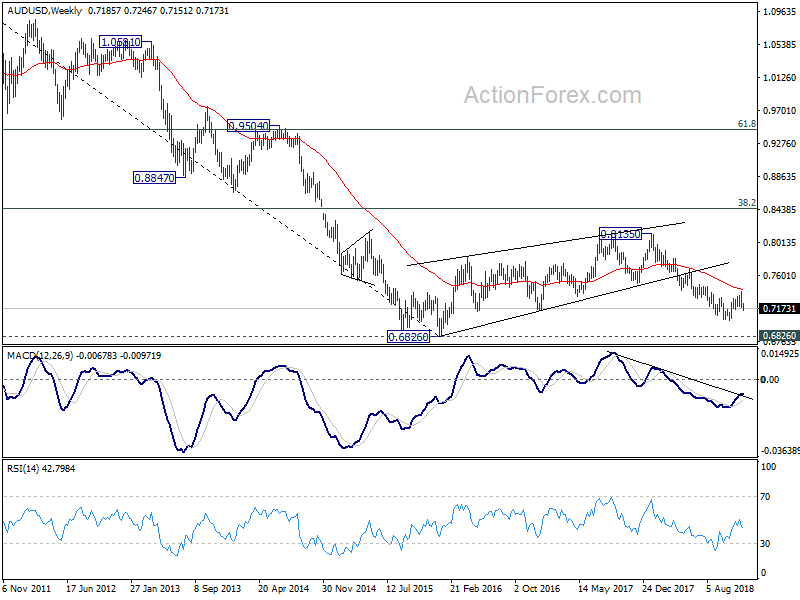 EUR/USD managed to hold above 1.1267 minor support despite Friday’s sharp fall. 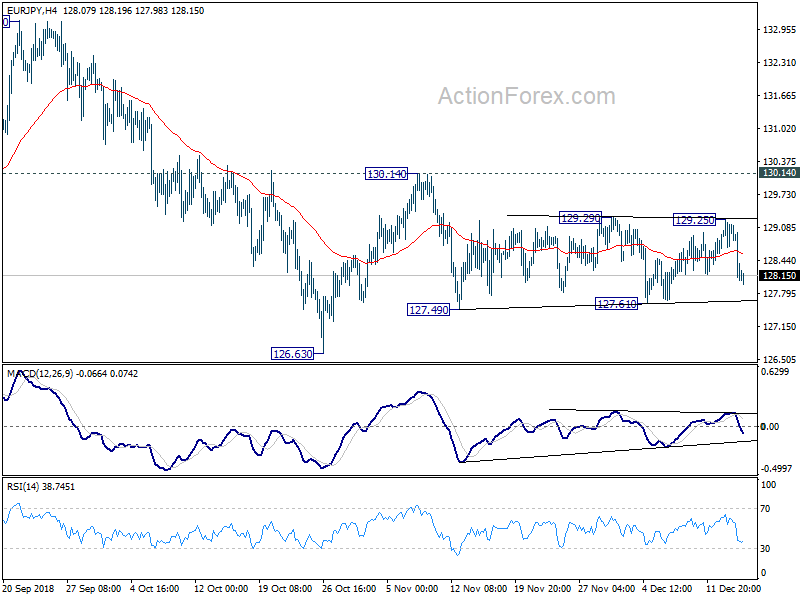 USD/JPY also retreated notably after hitting 113.70. The lack of conviction is reflected in the Dollar index too. It’s without a doubt still near term bullish, staying above trendline and rising 55 day EMA. But upside momentum has been diminishing for a while as seen in daily MACD. 61.8% retracement of 103.82 (2017 high) to 88.25 (2018 low) at 97.87 remains a difficult hurdle to overcome. Fed’s new projections and rhetoric will be a key factor to determine whether Dollar index can overcome this fibonacci resistance, or rejected by it. Break of 96.36 support will be an early, but important, sign of bearish reversal. We’re holding on to our EUR/JPY short (entered at 127.80, stop at 129.30) as updated last week. 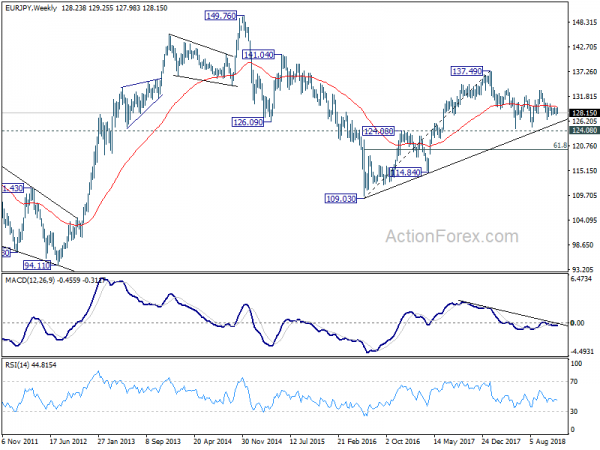 While EUR/JPY recovered to as high as 129.25 last week, it’s kept below our stop at 129.30. Subsequent sharp fall also kept our short position safe, and did nothing to change our bearish view. Thus, we’ll hold on to short position with stop unchanged. It’s a bit early to be medium term bearish. 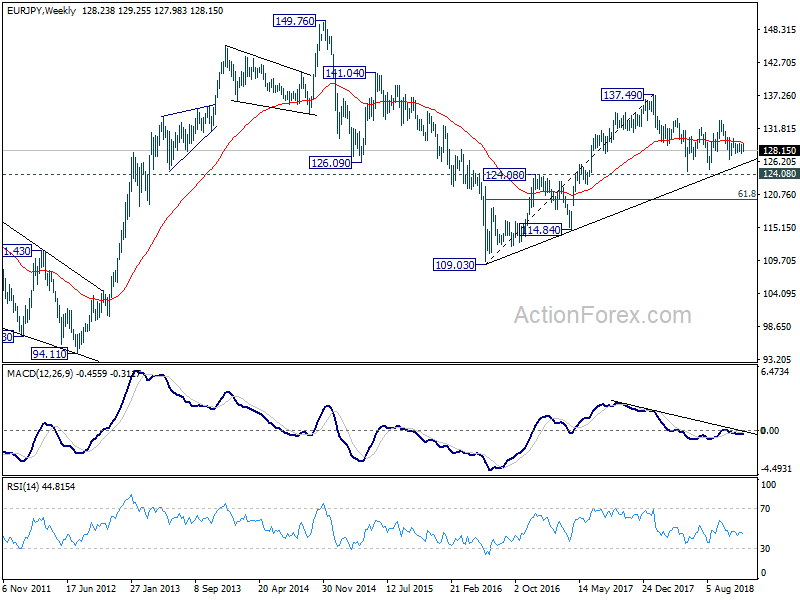 But EUR/JPY is staying below 55 week EMA which indicates underlying weakness. We’re envisaging the fall from 137.49 to resume eventually and extend to 61.8% retracement of 109.03 to 137.49 at 119.90. But we’ll also watch the reactions from 124.08 closely. 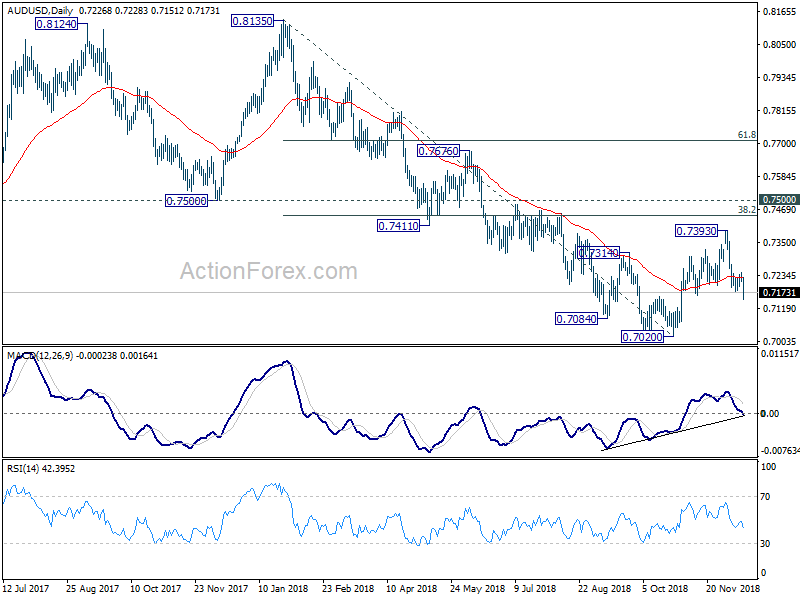 AUD/USD dropped to as low as 0.7151 last week. 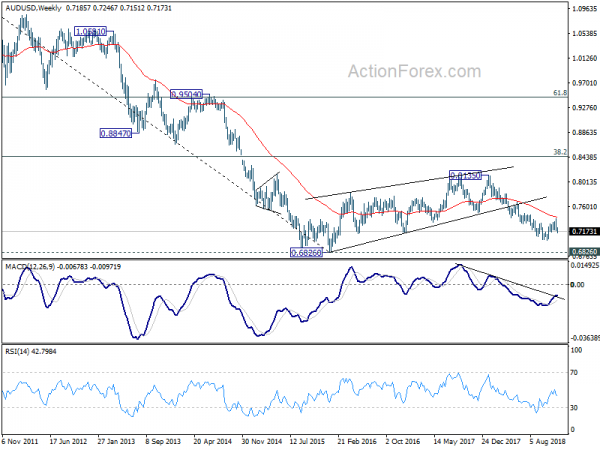 The development confirmed completion of corrective rebound from 0.7020 at 0.7393. Initial bias stays on the downside this week for retesting 0.7020 low first. On the upside, though, break of 0.7246 resistance will delay the bearish case and turn bias back to the upside. Rebound from 0.7020 could probably head to 38.2% retracement of 0.8135 to 0.7020 at 0.7446 before completion. In the bigger picture, a medium term bottom is in place at 0.7020 ahead of 0.6826 key support (2016 low). 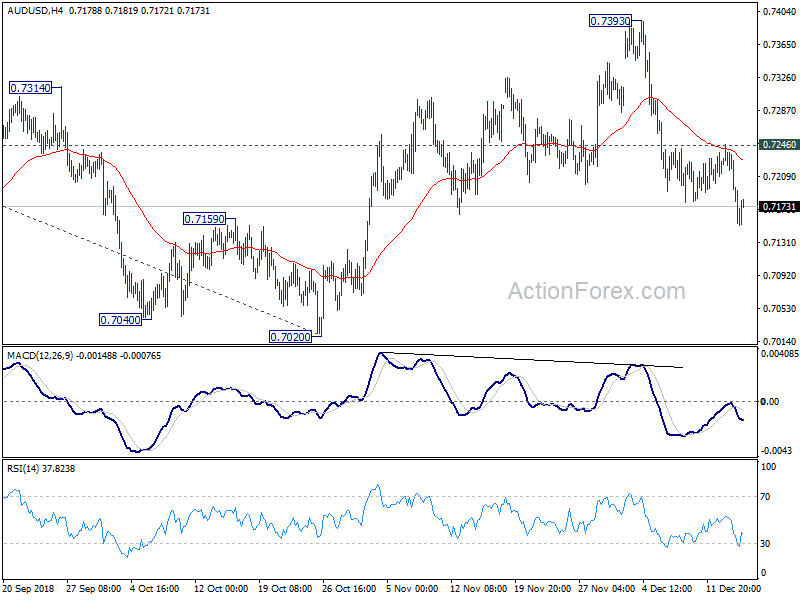 Stronger rebound could still be seen to correct the whole fall from 0.8135 high. But we’d expect strong resistance from 0.7500 support turned resistance to limit upside. Medium term fall from 0.8135 should resume later and extend to take on 0.6826 low at a later stage, after the correction from 0.7020 completes. In the longer term picture, the corrective structure of rebound from 0.6826 (2016 low) to 0.8135, and the failure to break 38.2% retracement of 1.1079 (2011 high) to 0.6826 at 0.8451, carry bearish implications. 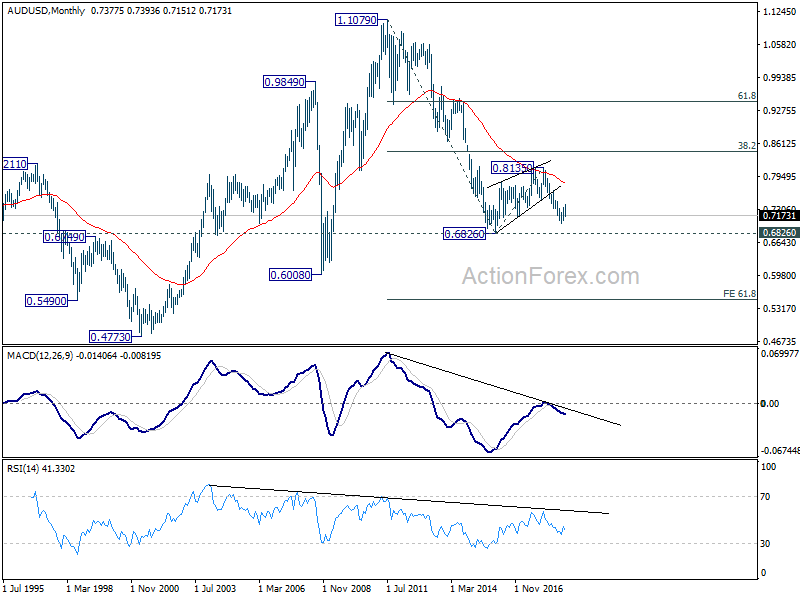 AUD/USD was also rejected by 55 month EMA. Now, the down trend from 1.1079 is in favor to extend. On break of 0.6826, next target will be 61.8% projection of 1.1079 to 0.6826 from 0.8135 at 0.5507.